The Boy From Fond du Lac, Wisconsin, originally uploaded by jjjaspersen. This is a drawing/collage I made called "The Boy From Fond Du Lac". Its a portrait of my grandfather, Richard Poetter. He was born and raised in Fond Du Lac, WI, trained for the ministry and ended up with a 40-year stay in Japan as a WELS Lutheran missionary. The artwork addresses his roots in these two places and his reflection on his life as an old man. 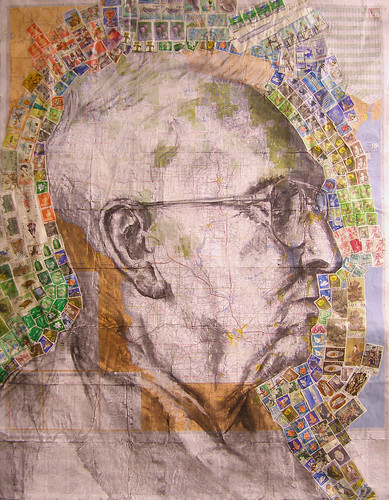 Its drawn with charcoal on a road map of Wisconsin and his profile is surrounded by Japanese postage stamps that he saved for me when I was a boy. Grandpa Poetter retired with his wife, Ikuko (Grandma Poetter), to New Ulm, MN in 1991. He died at the age of 88 on October 8, 2011. His passing has led me to evaluate his life and ministry again and to realize more fully his effect on my life. I knew him from the occasional leaves of absence that missionaries were allowed. He and grandma would visit once every 3 years in my youth. As a missionary in Japan in the early 1950's he entered a broken, impoverished nation. Tooling around the countryside in his Jeep he worked long hours with translators and volunteers to spread the Gospel. He and the missionaries that joined him built a legacy of congregations, a seminary, and a synod by which the Lord worked to reach many souls. In retirement he offered us his considered wisdom and encouraging smile. I'm proud of his accomplishments. He will be missed by his family, friends, and parishioners around the world.